Video of how to install a 36 or 48 Volt To 12 Volt Voltage Reducer in your EZGO, Club car, or Yamaha Golf Cart. Most accessories on your golf cart use 12-volts, such as brake lights, tail lights, turn signals, horns, headlights, radios, GPS and others. Most golf carts have either four 12-volt batteries, six 8-volt batteries or eight 6-volt batteries which are considered 48 volt system golf carts. (4X12v=48v) (6X8v=48v) or (8X6v=48v). Some golf cart’s use a 36-volt system consisting of six 6- volt batteries. (6X6v=36v). 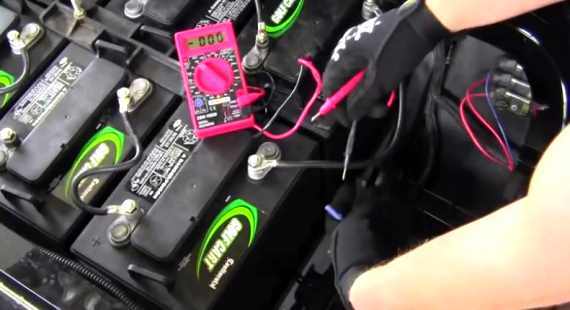 Adding a 36 or 48 Volt To 12 Volt Voltage Reducer will allow you to spread out the power usage among all your batteries. This will keep 1 or 2 or your batteries from going bad much sooner than the others.